Aerobic exercise, best known as cardio exercise, primarily involves exercise that’s performed at a ‘relatively low intensity,’ which usually depends on the body’s aerobic energy generating process. In other words, it’s a form of exercise that’s designed to help promote the use of oxygen to help stimulate the body’s energy demand during exercise. That promotion of oxygen within the body naturally involves the heart and the rest of the cardiovascular system. The heart and the cardiovascular system actually work in conjunction with the body’s respiratory system to make that happen. The lungs and the rest of the respiratory draw in oxygenated air, the lungs themselves retaining that essential oxygen for delivery within the blood. When that oxygen reaches the blood, the heart helps circulate the blood throughout the lungs and the rest of the body. Cardio exercise helps promote that ‘mechanism of action,’ and is perhaps the main reason why cardio itself is a great conditioning exercise in the first place. So, naturally, you need the right equipment to do effective cardio. 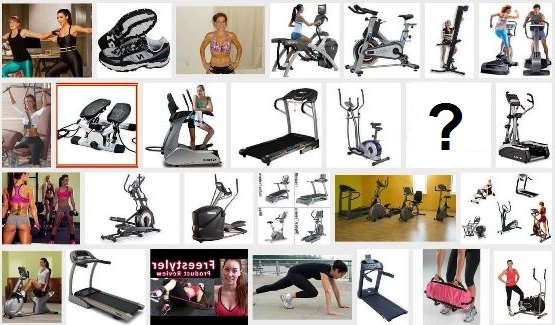 What should I look for in good cardio equipment? What makes a cardio machine the best home cardio equipment to use? Well, one of the most important guidelines to keep in mind when searching for the best home cardio equipment is the machine’s primary function. That primary function is how the machine effectively elevates your heart rate. Safely elevating your heart rate helps the heart perform its job—quickly pumping oxygen-fortified blood throughout the body. How much should cardio equipment raise your heart rate? Well, some of the best home cardio equipment can raise your heart rate to as much as 85% of your maximum heart rate. Cardio workout machines that are that effective in raising your heart rate are pretty much considered a good piece of cardio equipment to have. Though, that’s not the only factor that makes a piece of cardio workout equipment, well, good. It also needs to efficiently work the body’s large muscle groups or even the entire body. To even raise your heart rate to higher levels, you need a machine that can accomplish just that. Some of the best home cardio equipment machines are usually treadmills, rowing machines, bikes and elliptical machines, since they work many of the body’s large muscle groups at the same time. So… why is it important to get home cardio equipment that works the muscle groups? Without working the body’s major muscle groups, you can’t generate the energy needed to facilitate blood flow within the body, ultimately promoting the ‘oxygenating’ effect of many cardio workouts. So, that naturally means that you need a machine that’s pretty much good at helping you generate the energy you need to work your muscles and raise your heart rate. And, when you generate that much energy when using a piece of cardio equipment, you and the equipment will get hot. Interestingly enough, some of the best home cardio equipment have cooling fins or other cooling devices to help bring down the machine and yourself to manageable temperatures. It’s because a good cardio machine gets hot, thanks to its energy generation effect. When energy gets generated in a meaningful way, the components generating the energy emit heat. So, when you’re working away on a cardio machine, you’ll get hot and the machine will get hot. Cardio machines that acknowledge that and accommodate that are considered some of the best home cardio equipment on the market. All right, so can you tell me more about best home cardio equipment? What type of home cardio equipment should I choose? Some of the best home cardio equipment are actually a lot simpler in design than you would think. Many of these essential workout machines have a good amount of weight, fit in many homes and can be found anywhere you can buy quality exercise equipment—online and offline. The treadmill is one of the best home cardio equipment, since it’s so simple to get used to using on a semi-regular basis. Probably your biggest setback with getting a treadmill is the price. That’s because it’s actually not recommended to get a ‘cheaper’ treadmill, as the build quality usually isn’t worth the price of the machine itself. Some treadmills might even be too big for your home, but if you can afford the price and the space of owning one, it’s perhaps the best home cardio equipment you can get. The elliptical is a good alternative to getting a treadmill, but you should avoid much of the same pitfalls as a treadmill when looking to buy one. To start, you don’t want to get a cheaply made one, and you don’t want a machine that’s not known for having good build quality. So, that leaves you with a wide selection of appropriately priced machine that work as the best home cardio equipment out there. Read more about compact elliptical trainers here. Rowing machines, as mentioned, are a great cardio workout machine—and, perhaps, are the best home cardio equipment that you can buy for your money. They simply help work most of the major muscles groups within your body and help generate a lot of bodily energy. Like with treadmills and ellipticals, you do need to spend more to get a better rowing machine that’s capable of performing cardio workouts. The stationary exercise bike, although you also need to spend more on this machine, provide a rather inexpensive cardio equipment option the aforementioned. To find an exercise bike that’s worthy of being considered the best home cardio equipment, avoid buying any exercise bike that’s lighter than 100 pounds. Sometimes, the best home cardio equipment comes in the form of something that’s not entirely a machine. Buying a good pair of athletic shoes is a great way to get started working with a regular cardio workout. You can use those shoes to walk, run, jog, perform machine-less cardio exercises and routines, in addition to just dancing around. Pair that with a jump rope, and you probably have the best home cardio equipment for your money. So, even if you don’t immediately buy a cardio machine, there are still ways to get a well rounded cardio workout. Click here for my latest reviews and news on home cardio equipment. Ok, how you ended up on my site, I have no clue. There is no prize to win for guessing either. Over the last couple of years (and many year to come) I have filled this website with in-depth content covering a wide spectrum of fitness related issues. Enjoy! Home Workout Equipment – What’s Your Best Choice? © 2019 SOLE E35 Elliptical Reviews (Mar. 2019!). All Rights Reserved.